Paul Ryan, the 2012 Republican vice presidential nominee, was in Iowa last Friday – his first stop in the politically important state since the disastrous 2012 campaign ended. 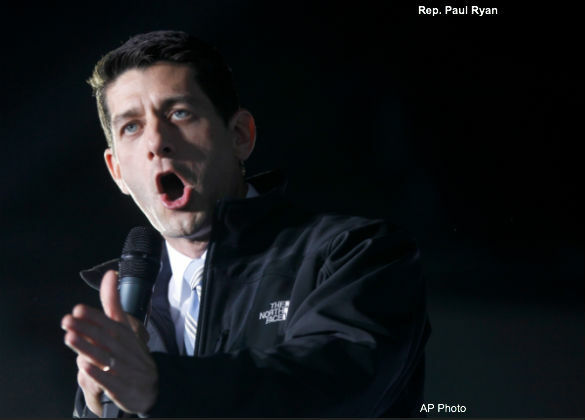 Congressman Ryan’s appearance in Iowa was noteworthy for several reasons. Immigration “reform” is of course code among establishment Republicans for amnesty for illegal aliens; otherwise Ryan would have said it is crucial that Republicans deliver on border security, and prevention of tax evasion, identity theft and public benefits fraud. We are still astonished and disappointed in how Florida Senator Marco Rubio squandered his conservative and Tea Party movement base by becoming the face of S. 744 – the Senate’s “Gang of Eight” amnesty for illegal aliens legislation. Now it looks like another promising Republican, House Budget Committee Chairman Paul Ryan, is about to follow Rubio down the plank and over the side into the shark-infested waters of granting amnesty to illegal immigrants. Ryan, who has many fine personal qualities and conservative instincts, should be smarter than to get sucked-into supporting anything remotely resembling the corrupt pork and special interest favor bloated Senate bill. The conservative-leaning voters who opposed S. 744 are not “anti-immigrant” and are prepared to have an honest and forthright conversation about how to secure our borders, deal humanely with the millions of illegal aliens already in the country and ensure that the flow of illegal immigrants is stopped once and for all. What they are not prepared to do is dole out millions of dollars in slush funds to radical Hispanic political organizations like La Raza, grant vast new powers to the federal executive branch, insulate it from Congressional direction and oversight, brings millions of new clients for the welfare state from illegal and ineligible for benefits status to legal and eligible for benefits status and grant blanket amnesty to illegal immigrants who are in jail – and that’s just the beginning of conservatives’ factual analysis of why S. 744 is contrary to conservative principles, bad for Republicans and bad for our country in general. Unfortunately, along with Paul Ryan’s fine personal qualities comes a penchant for granting the kind of deference to the interests of the establishment Republican Party’s corporate paymasters that Pat Buchanan decried. The shills for the U.S. Chamber of Commerce, the cheap labor opportunists and the inside-the-Beltway party hacks of the “buy the Hispanic vote” wing of the Republican Party did their best to neutralize and discredit the outraged conservative base during the Senate’s hurried deliberations on S. 744. Yet, as far as we can tell, no one out here in real “outside-the-Beltway America” was convinced that S. 744 – with its amnesty, corruption, pork and special interest favors – is a good bill. However, it certainly destroyed trust in Marco Rubio and eliminated him as a conservative leader. Rubio plummeted out of contention in the Republican presidential straw polls, going from number one or two to not even garnering one vote in our own CHQ poll and down at number five in an important Iowa poll. Conservatives, like Senators Ted Cruz, Rand Paul and Jeff Sessions have the right ideas on how to deal with our illegal immigration problem. House Judiciary Committee Chairman Bob Goodlatte and Committee members Steve King, Louie Gohmert and Lamar Smith have been on the right track in opposing anything remotely resembling S. 744 as well. We welcome Paul Ryan to the debate on how best to apply conservative principles to immigration reform – something that eluded Senator Rubio. If Paul Ryan wants to avoid Marco Rubio’s fate he must begin by publicly and forcefully rejecting anything remotely resembling amnesty for illegal aliens, along with the corruption, pork and special interest favors of S. 744. To arm yourself intellectually for the battle over amnesty and illegal immigration, watch the videos in our “Short Course” on amnesty and immigration and be sure to sign our "no amnesty" petition. Submitted by vtdelacy on Mon, 11/18/2013 - 14:51. Ryan was part of the Romney team which failed last year and we need a nominee for the Presidency who has demonstrated a firm spinal column regarding his stand on the issues that confront our nation which is why my preference for that nomination would be Senator Ted Cruz who stood on the floor of the Senate for over 21 hours in his effort representing the already expressed will of the majority of the electorate to defund/repeal the socialized medicine bill opposed by well over 2/3 of the citizenry. He would make an admirable candidate toward becoming the first American President of Hispanic descent on the Republican ticket for 2016. Run, Ted, Run! Submitted by aarona422 on Mon, 11/18/2013 - 13:44. When George W Bush was President, Paul Ryan voted for just about every big government conservative legislation that came his way. Paul Ryan was mentored by Jack Kemp. That should tell you all you need to know about whether he is an Establishment Republican or a limited government conservative. Jack Kemp was RINO before RINO was even a popular term. On a side note regarding Marco Rubio, he made a very amateur move and it cost him. The junior Senator from Florida somehow took it upon himself to 'lead' on the immigration issue because he was latino. He unnecessarily jumped into a situation he was unprepared to handle, an issue way beyond his limited experience as a Senator. While most of the damage was done by the pro-amnesty position he took, some of the damage was done by how poorly he handled the entire situation. I don't see him getting re-elected in 2016.